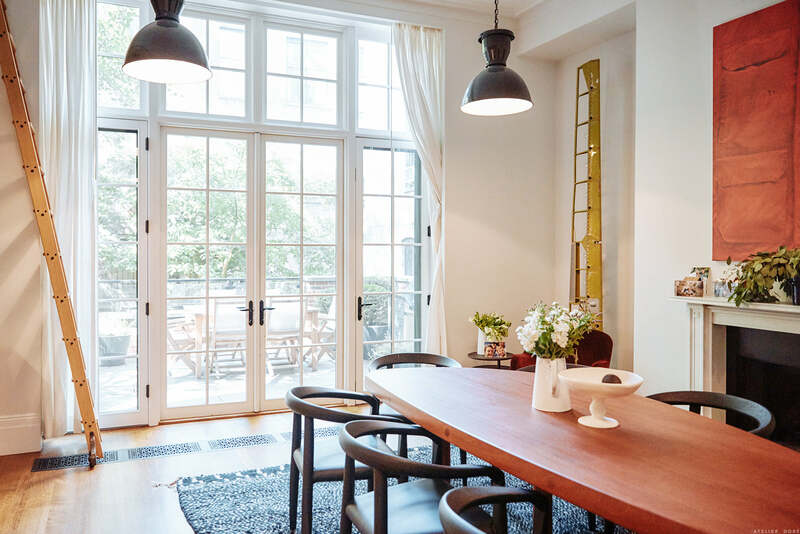 Nadine Abramcyk’s New York townhouse is a sanctuary in the middle of this bustling city. Nadine herself exudes the same calm demeanor as her interior and you find yourself immediately relaxed in her presence. Therefore it’s no surprise she is also one of the co-owners of tenoverten, which boasts salons and nail care all in the pursuit of non-toxic nail care and beauty. Nadine was kind enough to let us peek inside her sanctuary, which is all the more impressive once you learn she has two kids and a third on the way! You recently moved from a loft in Tribeca to this townhouse. What was it about this townhouse that made you swoon enough to move your family of four? I was craving a homier feel as our family was growing. A loft was wonderful, especially when it was just my husband and I, but as we had kids I started to realize the luxury of being able to close a door and have some privacy at home…which is still rare to find. We were very lucky to find this home with pocket doors to every shared space – the kitchen and living room areas – for additional privacy and 2 levels with the bedrooms being contained on one floor. You have an amazing collection of artwork in your home. Can you talk a bit about your philosophy when it comes to bringing art into your home? What you tend to gravitate towards and how you like to display it? I am someone who gravitates toward art that is very personal. For most art work in our home we either know the artist or have an attachment to the subject matter. I am also very drawn to photography and love the moodiness behind Todd Hido’s images and have one behind our bed and our dear friend’s Mia Baxter work in our bathroom. My husband and I buy each other art work for most birthdays and anniversaries. Your brand, tenoverten, was built in the pursuit of non-toxic nail care. Do you bring that philosophy to all aspects of your beauty routine? What are some of your favorite non-toxic beauty products in your daily beauty routine? I am obsessed with ingredients in all of my beauty products across the board and am so excited by what’s going on in the clean beauty space since there is so much innovation happening right now. I am constantly trying new products but some of my go to’s are Olio e Osso No.1 clear balm for lips and cheeks, Agent Nateur deodorant, David’s fluoride free toothpaste, True Botanicals Vitamin C Booster and Osea Anti-aging Body Balm. Indulge in a hammam style ritual in my bathroom – I dry brush first and then run a warm bath with typically pouring in loads of epsom salt. I usually soak for a minimum of 20 minutes and take that quiet time to either meditate or read. Then I jump into the shower with very cold water and stand under the running water for 60 seconds then run warm water for 60 seconds switching back and forth for at least 3 rounds. I create my very own hammam spa experience at home and then am able to jump straight into bed afterward which no luxury spa can offer. You have two kids with a third one on the way but besides the kid’s rooms, your townhouse is impressively void of kid accoutrements. What’s your design philosophy with kids? How do you design with them in mind while also maintaining such an adult aesthetic? My kids complain we don’t have enough toys all the time – so my minimalism is a constant battle at home. I really practice having them take their toys to their playroom every evening to clean up and am constantly giving things away or tossing things out. I really only keep things that I use which I think is a helpful practice in Manhattan where our living spaces tend to be on the smaller side. What are you most looking forward to about raising your kids in this specific house in New York City? I look forward to family dinners outside in the warmer months and frequent haunts to Washington Square Park which we now live so close to as a way to embrace nature as much as possible while living in an otherwise concrete jungle. This is a beautiful home . Calmness and serenity is needed in these hectic crazy days . What a wonderful Oasis, a sanctuary in the city. Beautiful chairs in the last photo! La maison est magnifique! Cependant, je trouve dommage qu’il y ai tant d’erreurs d’orthographe dans la version française!